1.Most land areas on Earth have some form of aquifer underlying them, sometimes at significant depths. These aquifers are rapidly being depleted by the human population. 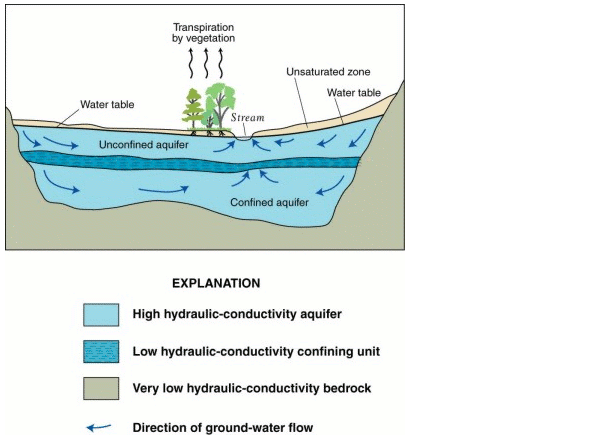 Fresh-water aquifers, especially those with limited recharge by meteoric water, can be over-exploited and, depending on the local hydro-geology, may draw in non-potable water or saltwater intrusion from hydraulically connected aquifers or surface water bodies. This can be a serious problem, especially in coastal areas and other areas where aquifer pumping is excessive. In some areas, the ground water can be contaminated by mineral poisons, such as arsenic. Aquifers are critically important in human habitation and agriculture. Deep aquifers in arid areas have long been water sources for irrigation. Many villages and even large cities draw their water supply from wells in aquifers. Municipal, irrigation, and industrial water supplies are provided through large wells. Multiple wells for one water supply source are termed “Well fields”, which may withdraw water from confined or unconfined aquifers. Using ground water from deep, confined aquifers provides more protection from surface water contamination. Some wells, termed “collector wells,” are specifically designed to induce infiltration of surface (usually river) water. Aquifers that provide sustainable fresh groundwater to urban areas and for agricultural irrigation are typically close to the ground surface (within a couple of hundred meters) and have some recharge by fresh water. This recharge is typically from rivers or meteoric water (precipitation) that percolates into the aquifer through overlying unsaturated materials. Occasionally, sedimentary or “fossil” aquifers are used to provide irrigation and drinking water to urban areas. In Libya, for example, Muammar Gaddafi’s Great Man made River project has pumped large amounts of groundwater from aquifers beneath the Sahara to populous areas near the coast. Though this has saved Libya money over the alternative, desalination, the aquifers are likely to run dry in 60 to 100 years. Aquifer depletion has been cited as one of the causes of the food price rises of 2011. 2. Fossil water or paleowater is groundwater that has remained sealed in an aquifer for a long period of time. Water can rest underground in “fossil aquifers” for thousands or even millions of years. When changes in the surrounding geology seal the aquifer off from further replenishing from precipitation, the water becomes trapped within, and is known as fossil water. The Nubian Sandstone Aquifer System is among the most notable of fossil water reserves. Fossil aquifers also exist in the Sahara, the Kalahari, and the Ogallala underlying the US Great Plains. A further potential store of ancient water is Lake Vostok, a sub-glacial lake in Antarctica. Fossil water is, by definition, a non-renewable resource.Whereas most aquifers are naturally replenished by infiltration of water from precipitation, fossil aquifers are those that get little or no recharge. The extraction of water from such non-replenishing groundwater reserves (known as low safe-yield reserves) is known in hydrology as water mining. If water is pumped from a well at a withdrawal rate that exceeds the natural recharge rate (which is very low or zero for a fossil aquifer), the water table drops, forming a depression in the water levels around the well. 3. The Great Artesian Basin situated in Australia is arguably the largest groundwater aquifer in the world (over 1.7 million km²). It plays a large part in water supplies for Queensland and remote parts of South Australia. The Guarani Aquifer, located beneath the surface of Argentina, Brazil, Paraguay, and Uruguay, is one of the world’s largest aquifer systems and is an important source of fresh water. Named after the Guarani people, it covers 1,200,000 km², with a volume of about 40,000 km³, a thickness of between 50 m and 800 m and a maximum depth of about 1,800 m. Aquifer depletion is a problem in some areas, and is especially critical in northern Africa; see the Great Man-made River project of Libya for an example. However, new methods of groundwater management such as artificial recharge and injection of surface waters during seasonal wet periods has extended the life of many freshwater aquifers, especially in the United States. 4.An example of a significant and sustainable carbonate aquifer is the Edwards Aquifer in central Texas. This carbonate aquifer has historically been providing high quality water for nearly 2 million people, and even today, is full because of tremendous recharge from a number of area streams, rivers and lakes. The primary risk to this resource is human development over the recharge areas. Match the headings to the paragraphs in the reading passage. 5.Fossil aquifers are not recharged by rain water. 6.Any amount of potable water drawn from an aquifer is safe. 7.Water in the Ogallala aquifer is constantly replenished by rain. 8.Aquifers in deserts dry up faster than others. 9.Cities are built over aquifers which are sources of fresh water. 10.Aquifers which supply water to farms and cities are near the surface, so water can be easily pumped. You’ll have to write 150 words in about 20 minutes. write 250 words in 40 minutes. Some people argue that it is more important to have an enjoyable job than to earn a lot of money. Others disagree and think that a good salary leads to a better job. Give reasons and include examples from your own experiences.